Jos Weyers got another notch on his guitar. He won the German impressioning championships in Hamburg yesterday. For those who know Jos this will not come as a surprise. And right after Jos came Arthur Meister. Arthur is as steady as Jos, just a fraction slower. And after six locks this adds up. Jord Knaap turned out to be the surprise. Before this weekend he barely impressioned a lock, but after an evening of practice with the ‘meisters’ he managed to get into the finals and open all six locks. Scoring a solid third place! 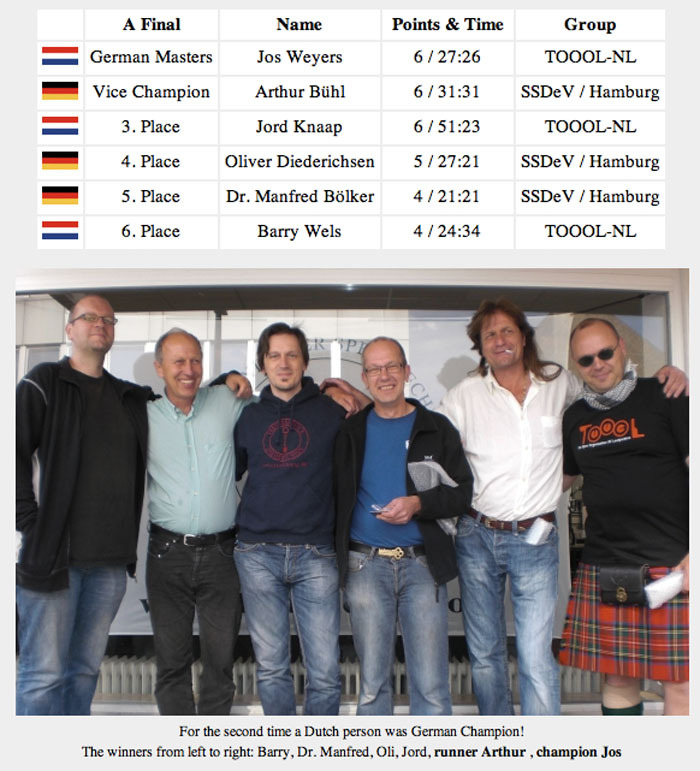 Impressioning heavyweights Oliver Diederichsen and Dr. Manfred BÃ¶lker became fourth and fifth. I knew I was not likely to end in the top three in this competition (due to lack of training) and scored a sixth place. Thanks everybody for a great weekend! Just a quick post before going to Hamburg for the German impressioning championships. We have a date for LockCon! It is going to happen the weekend of October 22-23, and already some interesting speakers have promised to give a presentation! The location most likely is going to be the good old hostel in Sneek, but if other options (in the Netherlands) come up we might be persuaded. Entries (RSS) and Comments (RSS). 46 queries. 0.322 seconds.